Ulnar neuritis, also referred to as cubital tunnel syndrome, is a condition characterized by inflammation of the ulnar nerve in the arm. 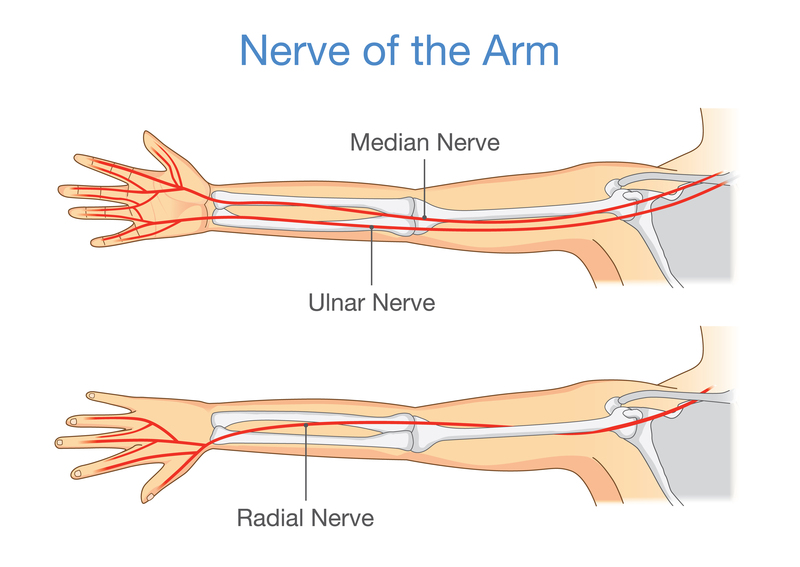 The ulnar nerve travels through a tunnel of tissue, known as the cubital tunnel, which runs under the bony aspect on the inner side of the elbow known as the medial epicondyle. When this area of the elbow is bumped, a sharp, electrical-type shock is experienced in the elbow and lower arm. This area of the elbow is colloquially known as the “funny bone” and the symptom is experienced due to direct trauma to the ulnar nerve. The ulnar nerve provides sensation to the inner half of the ring fingers and the little fingers in the hands. The nerve also controls most of the small muscles in the hand that assist with fine movements and some of the larger muscles in the forearm that help with making a fist. Performing activities that produce constant stress on the ulnar nerve at the elbow or wrist. Performing repetitive motions at the elbow or wrist. Pain and tenderness in the elbow. Referred pain to the forearm. Numbness and weakness of the hand. Difficulty in performing activities such as playing a musical instrument or typing. Irreversible muscle atrophy (shrinking) in the hand can occur if the ulnar nerve is compressed under a high pressure or has been compressed for a long period of time. This results in decreased power in the hand which may become permanent if the condition isn’t managed in time. Ulnar neuritis is clinically suspected by the examining doctor based on the history and clinical presentation of the patient. The condition is confirmed by performing electrodiagnostic studies, such as electromyograms (EMGs) and nerve conduction studies (NCS), which also assist evaluating nerve function. Avoid applying pressure over the medial epicondyle. Applying cold packs or compresses over the affected area to help reduce the swelling of the nerve. Avoiding activities that worsen the pain. Using medications such as anti-inflammatories to help reduce inflammation and pain. Using an elbow brace or splint to reduce movement of the elbow thereby reducing symptoms. Receiving physical therapy to incorporate exercises and techniques which help to strengthen the muscles around the elbow. Part of the medial epicondyle will be removed if that is pressing on the nerve. It’s important to consult with a doctor if severe symptoms are experienced or if they have been present for more than six weeks as this will reduce the risk of developing complications such as permanent muscle weakness in the hands. If there’s a sudden loss of sensation in the fingers or hands. If the ring and/or little finger can’t move.